U.S. stocks ended little changed on Friday and for the week as investors were mostly relieved that a selloff in technology during the week had not spread to become a broader market pullback. The S&P 500 gained under two-points last week, while the Dow Industrials’ fractional gain was enough for it to end the week with its 21st record close this year. Selling in technology shares drove the NASDAQ 100 Index down 1% last week, extending its two-week decline to nearly 3.4%. Yet within a week containing an interest rate hike by the Federal Reserve and an assassination attempt on Republican members of Congress, it was a pleasing enough outcome. The central bank raised its fed funds rate by a ¼-point to 1%-1.25%– its third rate increase in six months– and laid out plans on how they will begin to reduce their $4.5 trillion balance sheet later this year. For the week, the S&P 500 crept +0.12% higher, the Dow Industrials climbed by +0.52%, and the MSCI EAFE (developed international) gained +0.02%. What effect will reducing the Federal Reserve’s $4.5 trillion balance sheet have on fixed income markets? Reducing a balance sheet of this size is unprecedented. The Fed owns 13% of U.S. government debt and 33% of the U.S. mortgage-backed securities (MBS) market. With this in mind, it is likely that balance sheet reduction will push up bond yields as the Fed goes from being a net buyer to a net seller of fixed income. A complicating factor is that tighter monetary policy is expected to come at a time when duration within U.S. fixed-income is at multi-decade highs. Long duration means bond benchmarks are highly sensitive to changes in interest rates. This is a consequence of low bond yields and both corporations and global governments borrowing at longer maturities to lock in historically low rates. Duration for the benchmark Bloomberg Barclays US Aggregate Bond Index has risen from 3.7 years in December 2008 to 6 years in 2017. Not all fixed-income sectors respond the same way to a rising rate environment. Key among actions that can help fixed-income portfolios is to understand and manage duration and diversify across fixed-income sectors. Chart 1* highlights the price and total return performance of different fixed-income sectors when rates rise by 1%. Long-dated U.S. Treasury bonds tend to decline most sharply when rates rise, shorter-dated Treasuries less so. However, long-term investors do benefit from reinvesting at higher yields as rates rise. Outside the Treasury market, some higher risk sectors are likely to hold up well during a rising rate environment. 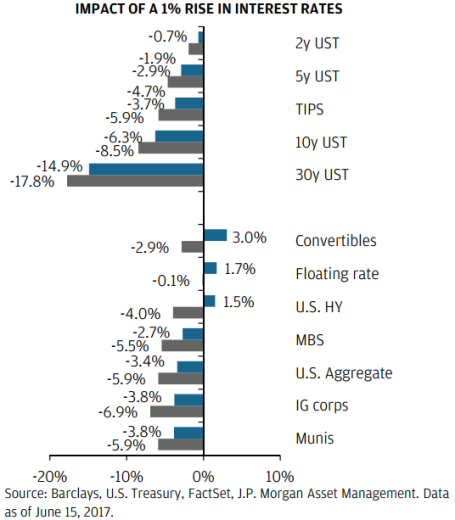 According to J.P. Morgan, investors generally see a 4% price decline when rates rise by 1%, but large coupons often offered in U.S. high yield bonds tend to, on a total return basis, offset much of these price declines, albeit with increased investment risk. For long-term investors, continued fixed-income exposure within a portfolio makes sense, in that it can provide downside protection if economic growth falters and a recession occurs sooner rather than later. In an environment in which risk assets may underperform, investors may turn back to the historical safety of core fixed income assets. * Chart 1 yields reflect yield to worst. Sector correlations are based on 10-years of monthly returns, while change in bond prices are calculated using both duration and convexity according to the following formula: New Price = (Price + (Price *-Duration * Change in Interest Rates))+(0.5 * Price * Convexity * (Change in Interest Rates)^2). Chart is for illustrative purposes only. Past performance is not indicative of future events or results.